Hurricane Gustav has strengthened to a major Category 3 storm. Winds are now at 120 mph and is still gaining strength. Gustav is responsible for 71 deaths in the Caribbean. 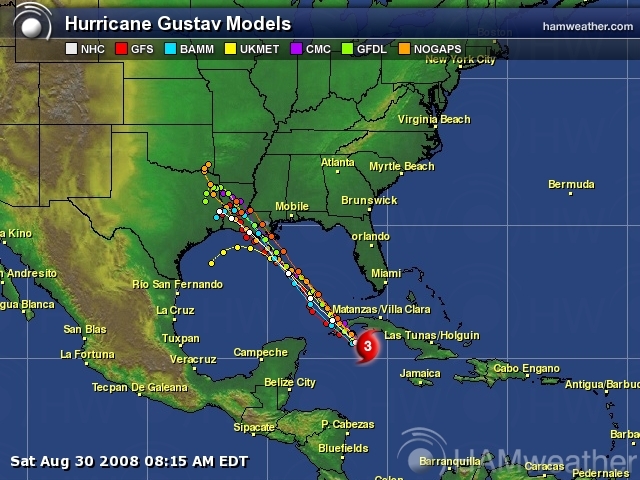 After crossing western Cuba, Gustav will move into the Gulf of Mexico and most models have the storm eventually reaching U.S. landfall in the Louisiana or Texas area. 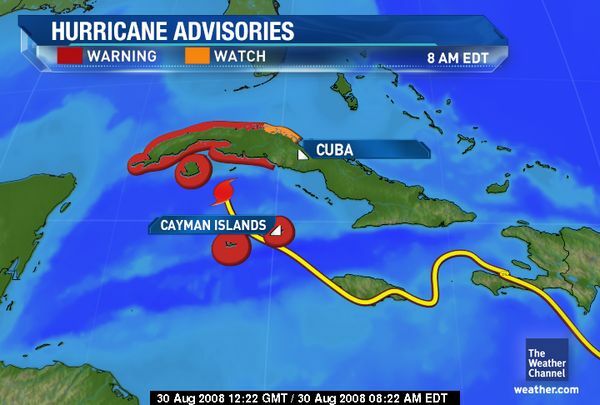 A hurricane warning is in effect for the Cayman Islands, the Cuban Provinces of Matanzas, Cienfegos, Pinar Del Rio, La Habana, Iudad De La Habana, Isla De Juventud, Matanzas and Cienfuegos. A hurricane watch remains in effect for the central Cuban Provinces of Villa Clara. A tropical storm warning remains in effect for the lower Florida Keys west of Key West to the Dry Tortugas for the central Cuban Provinces of Villa Clara, Sancti Spiritus, Ciego De Avila and Camaguey. A tropical storm watch remains in effect for the lower Florida Keys, west of the Seven Mile Bridge to Key West. Hurricane Gustav is located about 85 miles southeast of the Isle of Youth or near 20.8 north, 81.6 west. 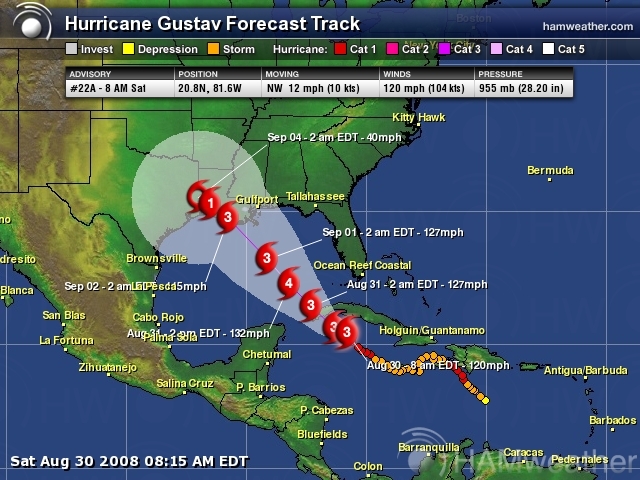 Gustav is moving to the northwest at 12 mph. Over the past couple of hours, Gustav has taken a more northerly track; however, it should resume a more northwesterly movement over the next couple of hours. Maximum-sustained winds are now 120 mph with higher gusts. This makes Gustav a major Category 3 hurricane. Hurricane-force winds extend outward from the center for 60 miles and tropical storm winds extend outward from the center for 160 miles. The estimated central pressure is 955 mb, or 28.20 inches. Gustav is gaining strength as is evident from satellite imagery and from land-based radar in Cuba. A distinct eye and eye wall has formed. The system is continuing to really wrap up with moisture feeding into the storm. Gustav will continue to grow in strength as it progresses over warm waters. Rainfall amounts of 6 to 12 inches are likely across western Cuba with local amounts of 20 inches possible. 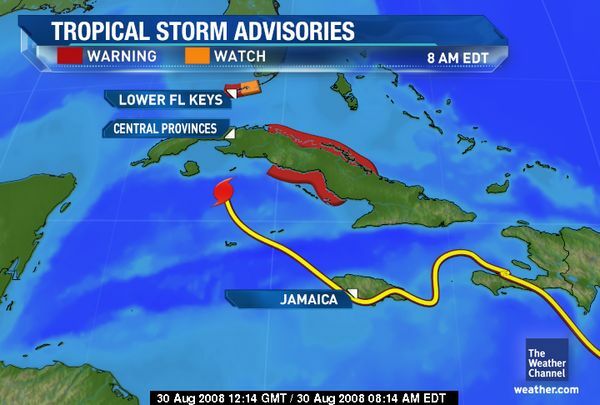 Weather conditions over Jamaica will slowly improve as Gustav slides to the northwest today. Gustav will move into the Gulf of Mexico on Sunday as a Category 3 hurricane and could become a Category 4 or 5 hurricane later on Sunday and Sunday night. There is even the chance that intensification will take place quicker than this. I hope to make these storm updates comprehensive, providing a complete tropical cyclone site – one that you will want to visit again. I attempt to include variety and more visual-friendly maps. If you have a specific request for a map or any suggestions on how I can improve your experience while you visit this blog, feel free to leave a comment. If this site has met with your satisfaction, feel free to let me know that as well. I appreciate all feedback. 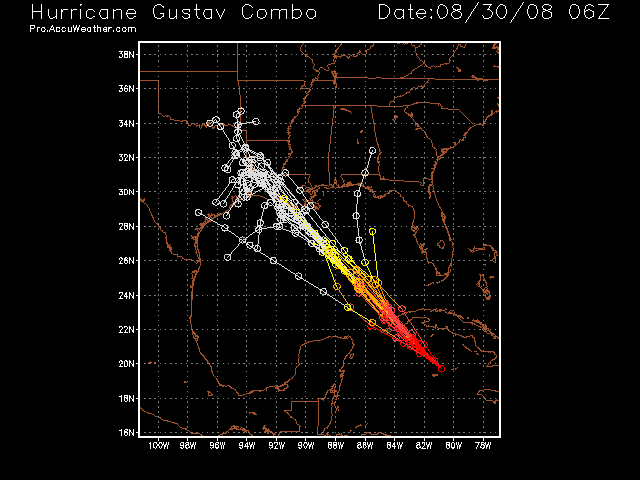 This entry was posted in Hurricane Season, My2bucks Eye On The Tropics, News, weather and tagged hurricane gustav, hurricane gustav computer model, hurricane gustav spaghetti model, spaghetti models, tropical storm gustav, tropical storm gustav spaghetti model. Bookmark the permalink. THANK YOU!! Your Website is a HUGE help. All information is here. Thank you for this site. I’ve visited it every day while tracking Gustav. So helpful! Love the spaghetti models. Thank you both for your feedback. 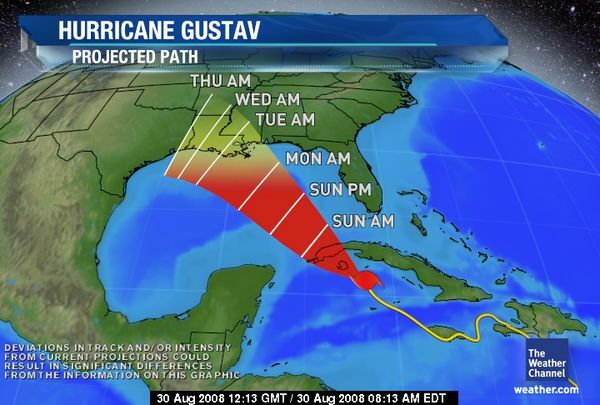 If either of you are in the path of Gustav, please be safe.